I believe I have shared my opinion on a painting needing lots of paint and texture before I am attracted to it--the artist we are featuring on this First Friday creates with me in mind I think. Carri Jobe is a Knoxville resident like myself, but, unlike me she creates lovely work on canvas and fabric. I enjoy everything about her work. The texture (I know I have said this already), color, shapes...It is just so pleasing to me. Carri has been able to share her work with many people around the globe and I am excited to share her art with you all today! Carri's stitched pieces are one reason I wanted to introduce her to you. As you might notice this body of work is wonderfully Fall-like to me. It is warm and inviting. This work is so different than the painted pieces...the painted work is cool and calming. Both have just as much depth as the other (in my humble opinion). Yet, in different ways. I'm no art critic (clearly...I don't know the jargon) but I like it. I was able to visit Carri's studio and saw the golden light that pours in daily from the aged yellow stained glass window. While I was visiting she said that golden light might bring some inspiration to her painted work. Carri's studio is one found in 17th Street Studios. This studio space Carri co-founded, is located in part of Redeemer Church of Knoxville's building. This is extra space that wouldn't otherwise be utilized and it now has a fantastic use. 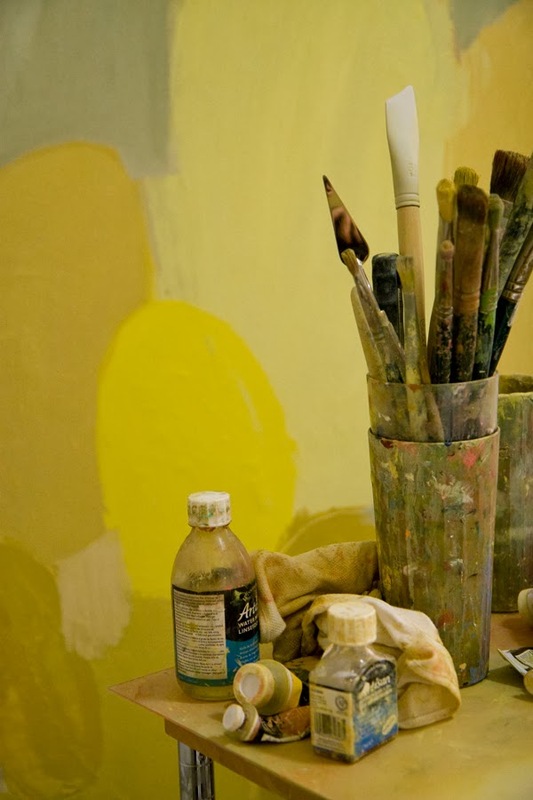 Many artists have individual studios they are able to rent and work in. This is a fantastic place. Have no fear, you will hear more about this very soon I believe. I wasn't able to see any of the stitched pieces in her studio as they were all at an exhibit in a Nashville Gallery. Should you find yourself in Knoxville this Saturday come to The Birdhouse for a joint opening Carri will be a part of. Her paintings will be on display starting October 5th-31st. I am excited to see more of her work and also to see who else will be joining her. AM: What lead you to the art world? CJ: I always enjoyed painting and creating art, but didn't make it my main focus until college. Two things helped me decide to pursue art: Encouragement from another artist friend, and an influential watercolor class that taught me the value of contemporary art. Even though I was interested in a number of subjects, I decided to study art because it was the most challenging to me. Also, I was fortunate to move to San Antonio, TX and experienced its thriving art community. Exploring the art world in Texas cemented my role as an artist for life. AM: Where does the inspiration for the shapes in your work come from? CJ: From varied image sources, including dishes stacked in a drying rack and historic quilts. The images are an initial platform from which to base my compositions. The work is about the formal aspects of the process, color and texture, and less about the initial imagery itself. However, I do think it's important that my source images are from an everyday, household subject. It's significant for me to be able to create from wherever I am. AM: I love the warm color palette you chose with the stitching collection, what made you choose those colors? To me these pieces are Fall. CJ: The medium guides my color choices. Yarn and thread seem inherently warm, so it's natural to choose inviting colors. 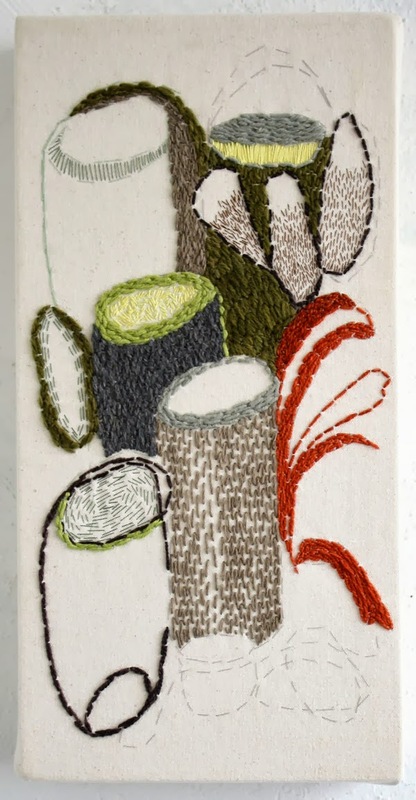 AM: Most of your work is painted, what made you decide to create the stitched work? CJ: When I lived in New York, some of my friends would knit or crochet on the train or while they spent time together, etc. I liked the idea of being able to carry something with me to work on. I also thought it would be a good challenge to translate my paintings into a material rooted in applied design. My paintings are very movement oriented and emotional, so the stitching was a way to slow my process down and make it more measured. AM: Do you think being from the South your work at all? CJ: I know that the south has a role in my work, but not in an overt way. It's a part of who I am, so it's a part of my work by default. I don't necessarily think about being Southern when I create work. However, the pace of the south is very important to my process. I live in Knoxville, Tennessee and appreciate that there isn't a lot of pressure to make something happen quickly. It helps me think through what I'm doing. Since I've been back in the south (about 4 years), I've been much more productive than when I lived in New York or Texas. I think the region gives me freedom to work at my own pace and it's more of a joy to create. Or maybe I just feel at home. CJ: Paper. I first started painting on paper and still love it. There is something renewing about putting the first strokes down on a piece of freshly stretched watercolor paper. 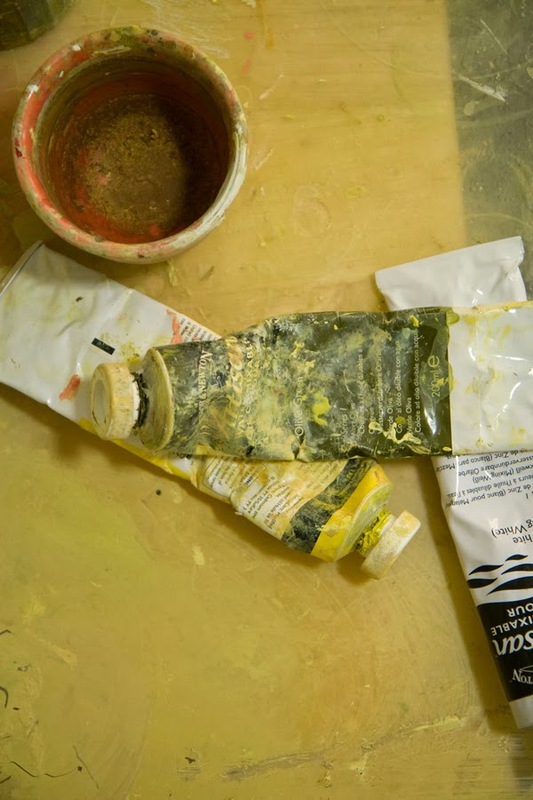 Color and texture dominate my painting process. 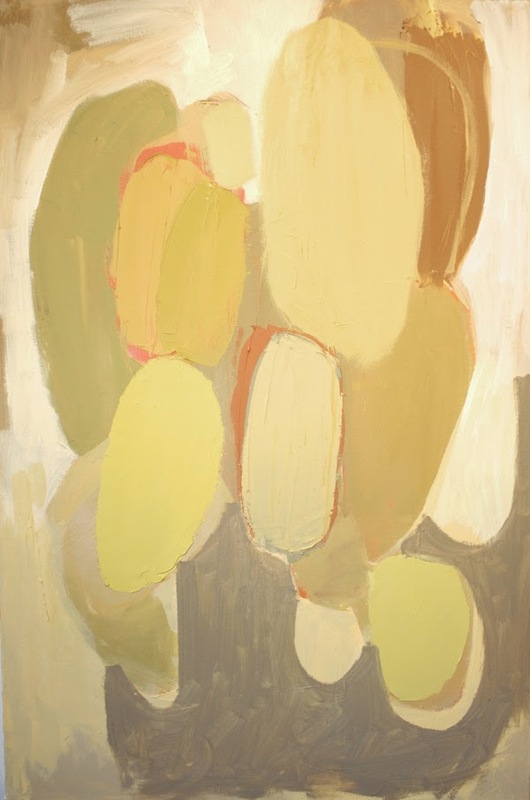 The placement of forms and selection of pigments invites tension and movement in the work. Intuitive marks and layered structures coincide to create active forms that imply mass and volume. These formal systems work together to reference the awareness of the mind. Some works explore general cognizance and others examine the exact point of comprehension. The stitching and paper works also utilize color and texture, but in a much more measured way. They explore pattern and slow growth as a reference to the daily routine of physical effort and development. These works provide concrete material that informs the more incorporeal paintings, just as habitual labor informs our sudden realizations. My art historical influences are Wassily Kandinsky, Giorgio Morandi, Phillip Guston, Helen Frankenthaler, Elizabeth Murray and Mark Bradford. 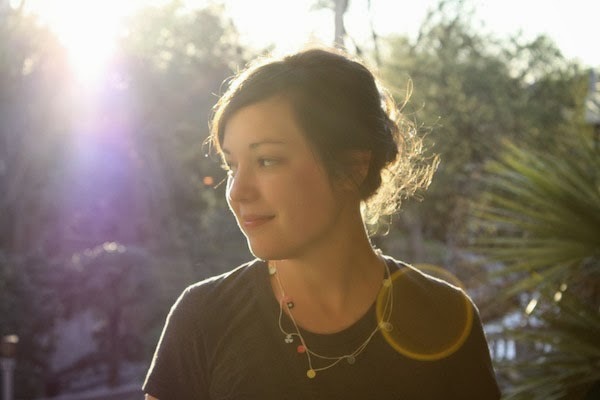 Carri Jobe is an artist living and working in Knoxville, Tennessee. She has practiced painting, drawing and stitching for 18 years and is currently exploring these mediums through a restricted set of formal concerns. 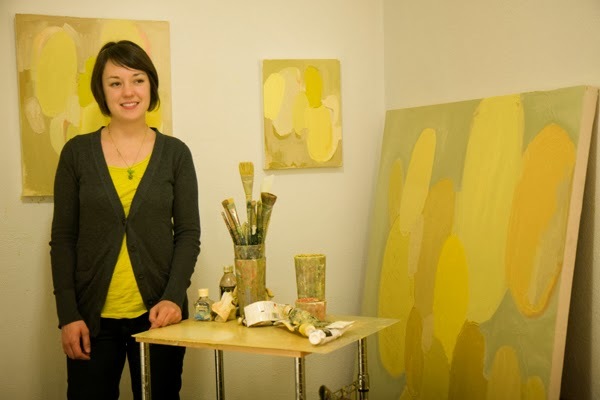 Her work primarily deals with color and texture and the visual impact these fused elements create. She has exhibited at the Chelsea Music Festival (New York City), the Alba de Leon Gallery (Sao Paulo, Brazil), C-Art Space (San Antonio, Texas), and Fluorescent Gallery (Knoxville, Tennessee) among others. Carri grew up in Nashville, Tennessee. She attended the University of Tennessee and received her BFA in 2004. After college, she spent four years in San Antonio, Texas where she painted, exhibited art and became involved in the Texas art community. 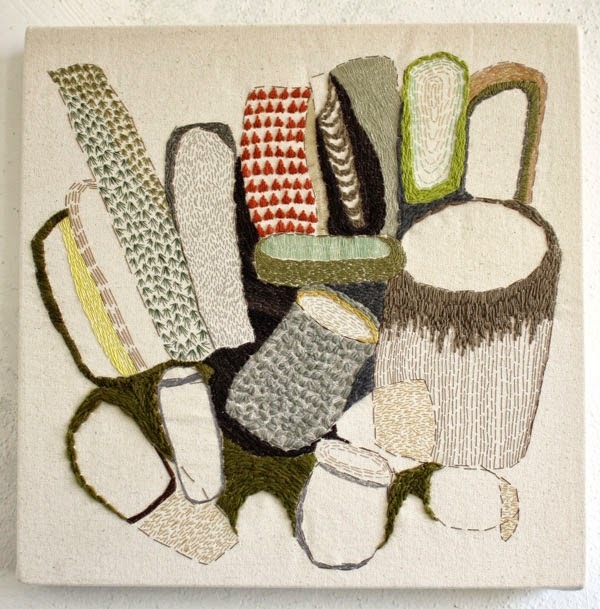 She then moved to Brooklyn, New York where she coordinated art handling & installation projects, and continued to paint and started her stitching work. 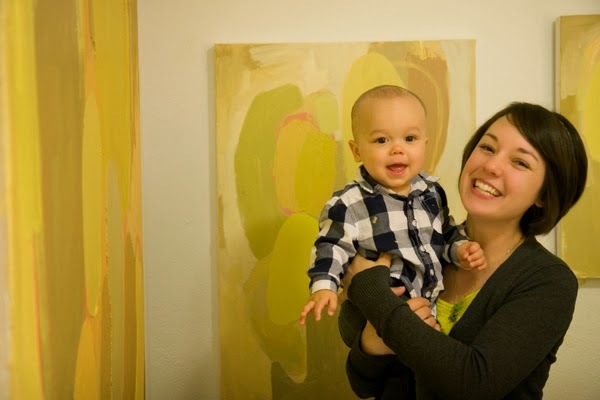 She and her husband, artist Brian R. Jobe, moved back to Knoxville in 2009 to spend more time on their own art practices and to be a part of the city’s art community. Carri is a co-founder of the 17th Street Studios in the Fort Sanders neighborhood.